Foreign or external affairs have received a great deal of attention through the ages. Though there has been no direct reference to the existence of a foreign department in the Rig Veda, the Aitareya Brahman in the Brahman literature mentions Indra having referred to the Marut as his Sachiva (the post of the minister who looked to the relations of the state with foreign nations). In the Taittiriya and Atharva Vedas, in the sense of an emissary or a messenger, the word Prahit is used. In the Bharatiya policy, doot is the emissary of a state in a foreign court and this usage can be traced as a root to the present day conventions and practices with regard to an ambassador. The existence of a foreign relations department in the Mauryan statecraft has a recurring reference in the Arthashastra of Kautilya. This is confirmed as being so by the Greek philosopher Megasthenes. Kautilya’s treatise on statecraft, the Arthashastra, is often compared with Niccolo Machiavelli’s The Prince for its cold political pragmatism. The difference between the two works exist regarding the subject matter as Machiavellian theories were mostly confined with the unification of Italy whereas Kautilyan theories embraced the Bharatiya policy, highlighting the concept of Vijigishu (conqueror). The Arthashastra viewed as a perfect culmination of the pros and cons of the Aryan policy and political philosophy advocates the re-ordering of the priorities of the Purusharthas (Dharma, Artha, Kama and Moksha) and gives precedence to materialism over religion and morality at the macro level. The concept of Mandalayonihi akin to the Rajamandala theory describes the circles of friendly and hostile states surrounding the king’s state. The Kautilyan polity seems to go well with the adage ‘Nayagyaha prthivim jayathi’ meaning one skilled in diplomacy wins the world. Though today’s world is different from that of Kautilya, especially with respect to the realms of consciousness and technological developments, the relevance of the six facets of Nyaya (diplomacy) would not go amiss. 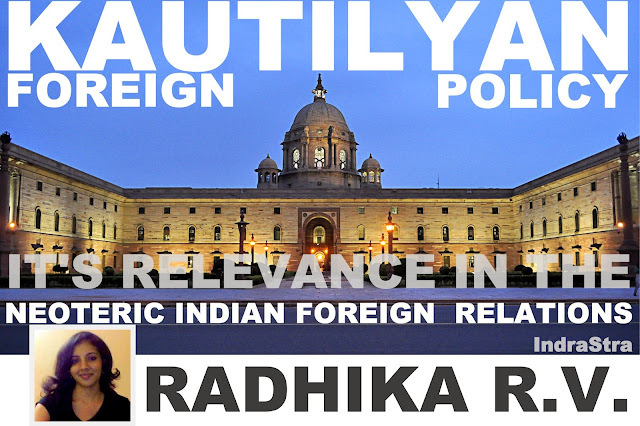 Kautilya’s description of foreign policy is based on the dictum ‘Peace is preferable to war’. The policy of Sandhi (making peace) is based on the rule that a state when faced with a more powerful adversary, must try to negotiate a peaceful pact in order to survive. If the dictum of making peace is analyzed, it can be understood in the context of several historical peace treaties. Kautilya also talks of other forms of Sandhi namely, Kal Sandhi (temporary alliance) or Sthavar Sandhi (permanent alliance) wherein a small state may bargain to live by rendering service to the stronger ally and living in alliances with the mightier ones. The policy of Asana can also be described as maintaining neutrality and is considered a practical option only for a strong state as generally, a weak state would be unable to maintain a neutral position. This is akin to India’s policy of Non-Alignment and its stance during the 2001-02 border stand-off wherein India had to follow its ancestor’s advice to observe neutrality. The policy of Yaanam (preparing for war), takes into consideration that when the constituent elements of a state which according to the Rajamandala theory include the king, minister, subjects or people, city, treasury, army, and ally, are on a rise and there is an increase in capabilities, the state should augment and mobilise its resources to prepare for a war. For instance, the preparations that India did before fighting the 1971 Bangladesh liberation war against Pakistan in training the Mukti Bahini. The practice of this policy is also evident in the military exercises that India has carried out near the Pakistan border. India’s efforts to improve its surveillance, fighting, and reconnaissance capabilities, commando, and Special Forces operations and air firepower denote the importance of this policy. The fourth facet of diplomacy, Samshraya (seeking support/shelter) is often put to use by the many states by allying with a stronger in order to bolster their own strength and increase their maneuvering space. India’s agreement with the Soviet Union prior to 1971 Indo-Pak war is one such example. According to Kautilya, when the constituent elements of the state are stronger than that of the enemy, the state should wage a war. However, Kautilya favors resolution of a conflict by diplomacy as far as possible and states that resorting to weapons should be the last remedy. The sixth facet Dvaidhibhaava (dual policy) is for a nation of moderate strength. It is nothing but resorting to peace and war at the same time with two different states. For instance, in the Mahabharata, the Kauravas had allies in order to wage war on the Pandavas and vice versa. New Delhi’s policy of seeking to improve its relations with China while simultaneously building its armed forces is a good example of Dvaidhibhaava. These Shadgunya (six-fold foreign policy) are made effective by the four-fold upayas (devices) mentioned in the Arthashastra which are considered as a doctrine of settling conflicts among the political powers. The devices Sama (conciliation or the art of gentle persuasion), Daana (placating with gifts or the usage of carrots), Bheda (the art of aggravating dissension amongst parties opposed to each other) and Danda (punishment or the usage of sticks) have a remarkable similarity with Hans Morgenthau’s realist theory. Apart from these policies, the types of warfare Dharmayuddha (righteous war) and Kootayuddha (concealed war) referring to the war aims of Dharma Vijay (righteous conquest) and Asura Vijay (demonic conquest), and Lobha Vijay (acquisitive conquest), respectively also find relevance in the contemporary labyrinth of diplomacy from time to time.